The local church has always been understood to be an organisation when, in fact, the local church is more like a living organism. Church leaders often try to replicate strategies and tactics that have worked well for others, but this "one size fits all" method doesn't work, especially as our culture and communities grow more and more diverse. Laity and leaders must clearly recognise their own unique ministry setting, and must make changes so that they are able to effectively fulfil their purpose in that setting. Our churches must adapt to thrive. The book includes a series of ten adaptive shifts that guides congregations and leaders in the process of change. These are not prescriptive or tactical steps. Instead, they are shifts in perspective and attitude, which enable the church to see clearly and to make changes wholeheartedly. 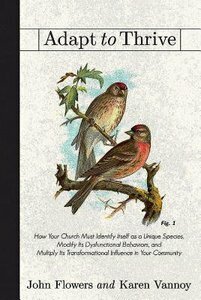 Through stories from real churches and the overarching metaphor of Darwin's finches, Adapt to Thrive offers an engaging resource for how your church can identify itself as a unique species, modify its dysfunctional behaviours, and multiply its transformational influence in the community.